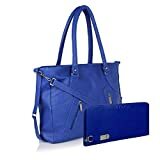 Features- Blue Colour Handbag, 1 Main Compartment, Big In Size, Can Carry Many Items In One Go. 1 Interior Zipper Slot Pocket, 2 Interior Open Slot Pocket, Can Put Keys,Coin,Or Other Small Daily Thing. Simply Designed, Perfectly Show Your Personality. 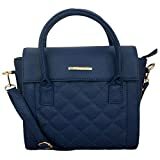 Shoulder Strap Is Detachable And Adjustable.Carried In 4 Ways, Tote Handbag / Hobos & Shoulder Bag / Satchel / Cross-Body Bag. Iconic Hanging Charm Design Has Been Kept In Inner Zipper Pocket To Ensure Safety In Transit. 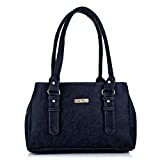 Fabric Lining In Dark Brown Colour , Not Easy To Wear & Tear, Classic Gold-Tone Hardware With Hanging Charm Design, Properly Covered With Paper To Prevent Any Kind Of Scratching, Proper Packaging With Dust Bag To Prevent Handbag From Dust Or Dirt After Use. A Rare Combination Of Curiosity, Creativity And Ambition Fueled The Rise Of Cathy London. We Pleased To Launch Our Spring-Summer Collection' 2016. With 35 Highly Professional Designers, Most Of The Products Are Hand-Crafted. All Products Are Made Up Of High Grain Pu Leather Which Are Equally Good As Genuine Leather But Without Killing Innocent Animal. 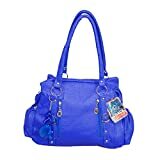 This hand bag from the house of Cathy London is made from synthetic material and comes in a shade of blue. 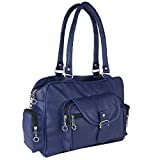 It is a suitable hand bag to store your belongings and essentials. 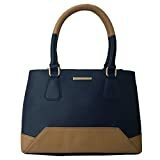 With adequate compartments, the handbag is a suitable store and carry option when you want to carry your stuff in style without compromising on utility. The handbag features a zipper closure which is a popular form of closure for handbags and provides a hassle free storage of your belongings. 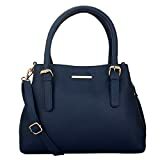 The handbag features 1 main compartment, 1 Interior Zipper Slot Pocket, 2 Interior Open Slot Pockets for storing and organizing your essentials.